Oven roasted mushrooms with garlic, shallot, fresh herbs and topped with parmesan cheese that are ready in 30 minutes and have endless uses. 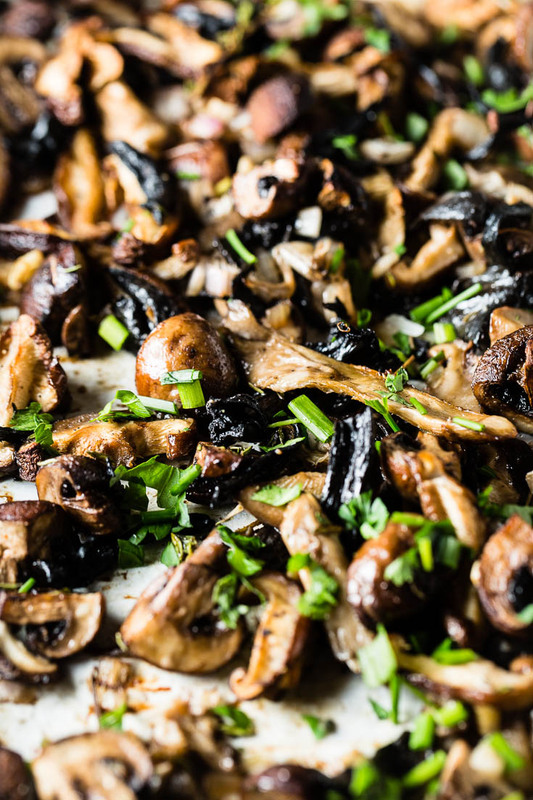 Mushrooms are so so versatile in their uses and they are so easy to make perfectly in the oven. Picking up good variety of mushrooms really gives you a lot of flavors and textures. For this batch, I roasted back trumpet, oyster, shiitake and cremini mushrooms. Common mushrooms like white button or Cremini mushrooms are available pretty much everywhere. Wild and other specialty mushrooms can be a little more difficult to find. Your local farmer’s market is a great place to find specialty mushrooms, Specialty Produce in San Diego also has a wide variety and Whole Foods is also a great place. 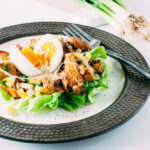 If you can’t find fresh wild mushrooms, or if they are out of season; dried mushrooms are a great alternative. 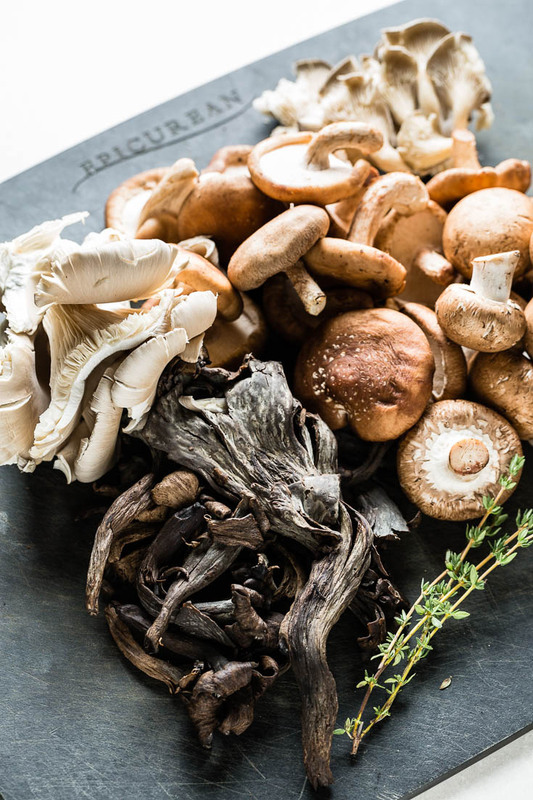 Wild mushrooms can be quite expensive, so using some filler mushrooms (like crimini) are great to add to the mix to save some money and add a more textures. A lot of store bought mushrooms need little to no cleaning. If you have picked up some wild mushrooms (which I would totally recommend), there’s a chance they brought some of their environment to your home. Cut the dirty bottom end off and use a paper towel or a cloth to wipe any loose dirt off the mushrooms; then use a bristle brush to remove dirt from any crevices. On the stove top in a skillet seems to be the most common way of cooking mushrooms, but I would argue that roasting versus sautéing is far superior. 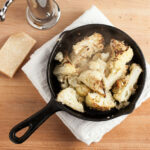 Once the mushrooms are in the oven, you can work on the rest of your dinner without worrying about them. Less oil – mushrooms are thirsty and can take a lot of oil to sauté them properly. Roasting requires only a few tablespoons of olive oil to cook them perfectly. Cook large quantities at once – mushrooms contain a lot of water and can take up a lot of room in a skillet, require cooking in batches. 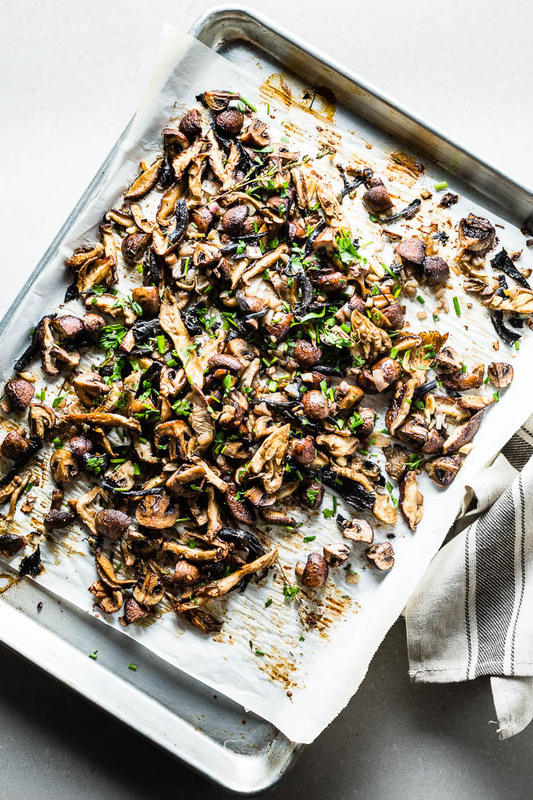 When you roast the mushrooms on a sheet pan (or two), you can roast a lot at one time. Less clean up – cooking mushrooms on the stove can make a mess with splatter. Roasting in the oven keeps everything on the sheet pan. Less manual labor – once they are in the oven, it’s a “set it and forget it” type of thing. No need to constantly stir or flip the pan. 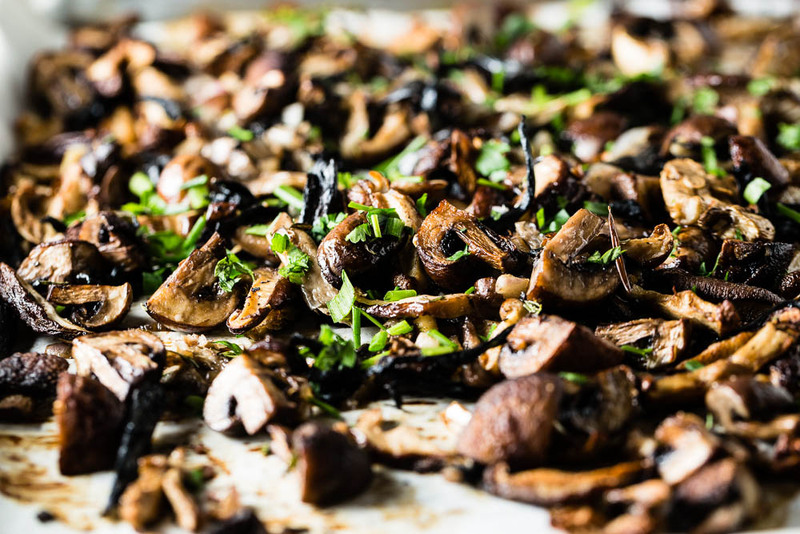 Roasting mushrooms is the easiest way to perfectly cook mushrooms every time. 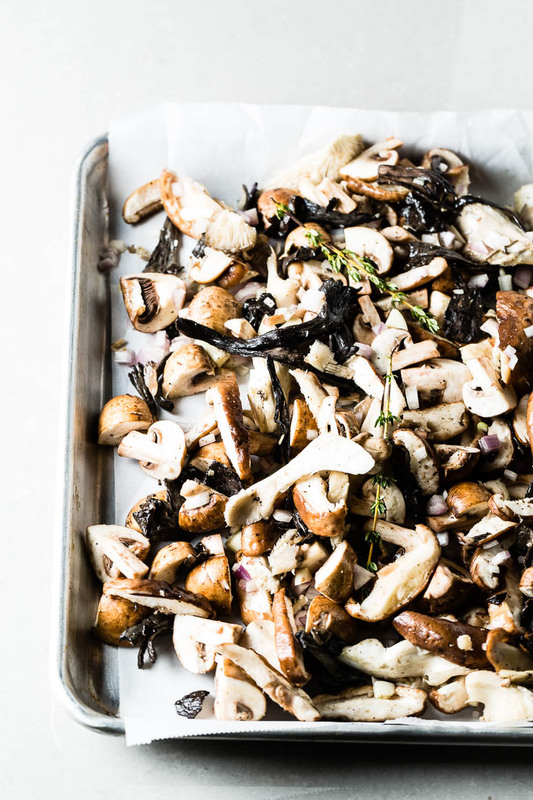 Preheat your oven to 400 degrees and simply toss the sliced mushrooms in a bowl with some olive oil, garlic, chopped shallot, kosher salt, freshly ground pepper and thyme sprigs. 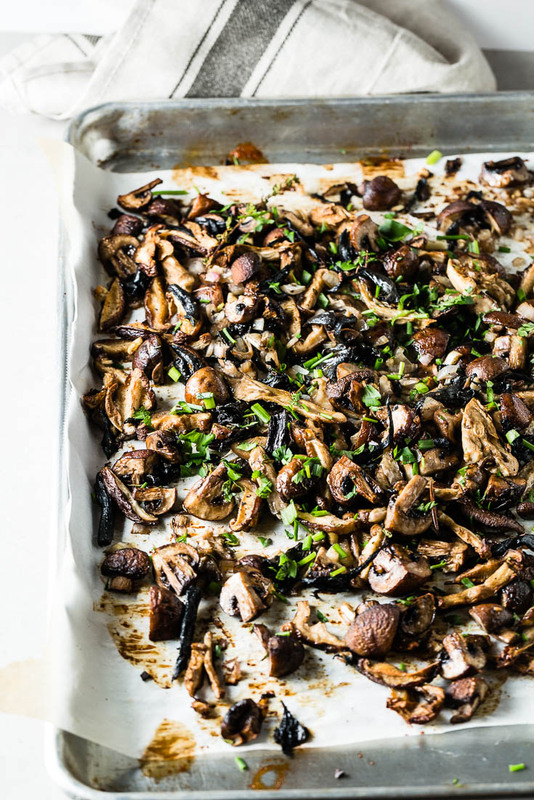 Transfer the mushrooms to a parchment-lined baking sheet and roast in the oven for about 25 to 30 minutes, or until they are golden brown and cooked through. Top with fresh herbs, parmesan cheese and a sprinkle of sherry vinegar if you wish. So you now have these beautiful roasted mushrooms. What could you possibly pair them with? It’s hard to think of what wouldn’t be perfect with them. Here are a few ideas: pasta, pizza, risotto, polenta, omelette, scallops, frittata, steak, chicken, on top of burgers. The options are pretty much endless and you can make a big batch ahead of time for use later. Preheat oven to 400 degrees (on convection if you have it). 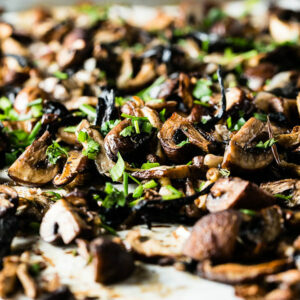 In a large bowl, combine the sliced mushrooms, olive oil, shallot, garlic, kosher salt, pepper, thyme sprigs. Roast in the oven for 25 to 30 minutes, quickly stirring halfway through. When the mushrooms are golden and cooked, remove the thyme sprigs. 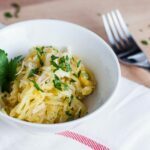 Drizzle with the Sherry Vinegar (optional) and top with the parsley and parmesan cheese. Taste for seasoning.